The pioneering study of chimpanzees that Dr. Jane Goodall began at Gombe in the Tanzanian rainforest in 1960 redefined the relationship between humans and animals. Today, with archives at Duke University (USA), it is the longest-running continuous research program of any species anywhere. In 1977, Goodall founded the Jane Goodall Institute (JGI) to support this research. Its innovative, community-centered conservation model has been applied widely across Africa’s great ape ranges. JGI’s environmental, humanitarian and educational program, Jane€™s Roots & Shoots, empowers young people of all ages to make a difference in their communities in over 130 countries, involving them in programs for people, animals and the environment. 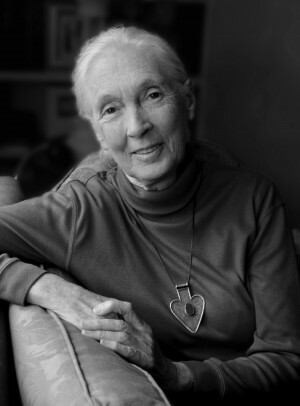 Featured in numerous television and other documentaries, including most recently the 2012 Oscar-shortlisted €œJane€™s Journey,€ Dr. Goodall€™s many publications range from the definitive scientific work on chimpanzees to children€™s books, while her contributions to science and conservation, and her wider social and humanitarian work, have been internationally recognized. A recipient of the Medal of Tanzania, Japan€™s Kyoto Prize and France€™s Legion d€™Honneur, she is a Dame of the British Empire and a UN Messenger of Peace.